As much as you make take such news with a pinch of salt, Fat White Family have apparently become sophisticated. They may have returned as the nominated pugnacious forefathers of an acerbic community in the capital, they’ve also walked in at an even more chaotic time in the country than when they left. So it would be remiss of us to not expect Fat Whites to chuck their two cents in, and they do so with ridiculous brilliance that will revoke any such provocations that the group have tidied up their act. ‘Tastes Good With The Money’ is turgid, a gritty and jittering romp with no hint of subtlety, and all the more contagious for it. Weighted wit meets absurdist catastrophe as brazen sax and drum fills hint at a wanton danceable beat, gurgling and unblushing as they deliver another goading yet poetic turn. Only Baxter Dury could really join them in such behaviour, famously apathetic as he drawls with creeping demure “you’ve got ash in your latte“. It’s delightful shithousery. 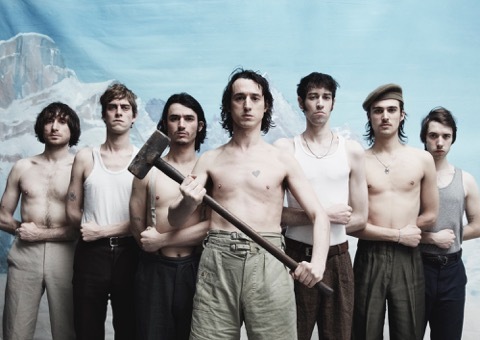 We bring Fat White Family to Southampton as part of their UK tour in May. You can get your tickets here. We’ve added the single to the So Young List on Spotify which you can follow here.